Over the last few months, our team has been working on some big changes that make it easier to ramp up video content at your company. 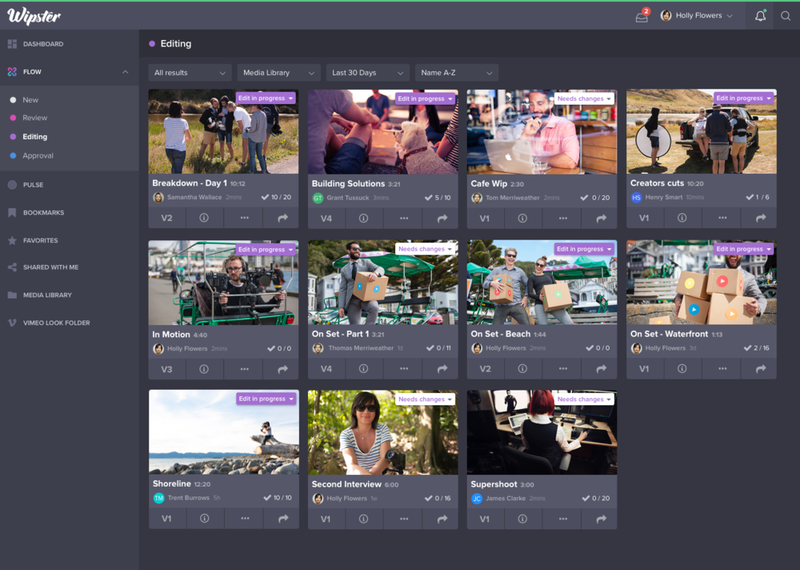 Today with the release of Wipster Flow, Pulse, and our Media Library, creative and marketing teams can collaborate on video revisions, store them in a shared multimedia asset library, publish videos across a variety of channels and easily understand the results—all within Wipster. New look, new products, new pricing, new Wipster! Let’s dive in and see what’s new and improved in today’s launch. The more videos you make, the more complicated it gets to keep track of projects. To eliminate this forever-chasing-up fatigue, we've added video states and stages to your work-in-progress projects so you instantly know where to focus your efforts and can finally say goodbye to those tracking spreadsheets. See what NEW projects need your attention, what’s currently being REVIEWed, what’s in the EDITING stage, and what projects have gained APPROVAL. Now you have more freedom in how you share your work with the world. Share for review, share for final approval, and check out the new Preview share option —perfect for presenting the final version of your projects. Our new dashboard brings all of your project and team activity front and center. Catch up on the most recent comments, see what needs your immediate attention, and what projects are falling behind. How did your latest video campaign perform? Good news! Now you won’t have to login to multiple social and video platforms and sift through tons of analytics to get your answers. Wipster has created the industry’s first video HealthScore. These scores aggregate analytics from all our integrated platforms and crunch them down into a very clear and understandable visual. HealthScores bring back the most important viewing, duration, and engagement data to keep you in the loop on how your latest video content is performing. Red or amber circles mean that the video could use a bit of work, and green means it was a success! As you scale up your video content strategy, delivering videos to each of your publishing platforms can be a time-consuming process. Now you can cut down on unnecessary busywork and one-click publish from inside Wipster to any of our leading video platform integrations, including Facebook, Youtube, Twitter, Wistia, Vimeo and Brightcove. When you're creating multiple videos per week it's easy to lose track of projects, so we’ve updated the side panel so it’s easier than ever to stay organized. Bookmarks keep your active projects close-to-hand and with Favorites you can reference your most inspiring work in one-click. The rest of your work can simply be found in the Media Library. Every asset in Wipster is a living, breathing bundle of data, history, and viewing analytics. No more searching across multiple documents or platforms. Each file contains a full review history, detailed metadata, and viewer engagement so that you have all the context you need. What good is a library if you can’t find anything? When you need to find all content relating to “brand”, or re-edit some footage of your last “event”, use Tagging and Global Search to keep your assets categorized, well organised, and easy to find. We hope these new tools will make it even easier to collaborate, manage multiple projects at once, push revisions out faster, share video with the world, and quickly iterate based on how they perform.